The Rare & the Beautiful... obscure issues of pulp magazines, full of fantastic, engrossing fiction... enter the world of collectible pulps (recent reading update). Also read previous Issue 1 and Issue 2. All reviews are by Avi Abrams, unless noted otherwise. So... come to "Brackett's SF Parlor" for some fictional spa work: rejuvenate your sense of outre, tickle your "hot" points of grotesque and sojourn in a land of perfect male heroes and super-sensuous females... for a while. No regrets, too - you know, it's good for you. That being said, this novella differs from the usual vein: it has a significantly more interesting planetary ecology, more realistic adventures and a toned-down plot (rooted in the way people actually behave). Thus, it reminds me more of Edmond Hamilton fiction (maybe he played a hand in this, you never know with such husband-wife writing teams) "The Lake of Gone Forever" is one of the most visually exciting pieces that Brackett ever wrote: much of it is placed among understated Antarctic-like landscapes, but there is no lack of cool alien stuff, either: mysterious cities, weird alien legends and serene warriors skillfully scattered throughout the plot. "Lorelei of the Red Mist"
Undiluted, guilty pleasure of the vintage pulp adventure... full of dark (somber and even macabre) tones, bathed in rays of soaring, brittle light - a heady brew, an experience not unlike a pint of complex English stout (paired with an aged cheese), enjoyed on the stepstones of a looming cathedral, not far away from an ancient cemetery, watching the purple haze and glorious golden-lined clouds of a dying sunset. The plot is not that important; the intensity of the narrative is. One of the most "sword-and-sorcerish" tales of Brackett develops into an underwater ghost story, complete with weird ocean-tree gardens and hallucinogenic seascapes. Half-way through the story Ray Bradbury takes the reins and steers this incredible novella to even loftier poetic and heroic heights. This is an outstanding novella: nothing much is known about Vic Phillips, who only published a few stories in Astounding between 1939-1942, so any info is appreciated. Well, turns out, this is a definitive treatment of "disaster in space" scenario: ship wreckage, mutiny, pirates, thick atmosphere of doom and more heroic action than in the best Hollywood disaster movies - plus entertaining, hard-hitting dialogue, with a hint of smart romance thrown in for good measure. I can see how this story can be "disaster voyage" category killer - it's hard to top Vic Phillips with a more hardboiled account. Although later efforts were made (for example, the excellent "The Star Lord" by Boyd Elanby, and Ray C. Noll's "Flight Perilous!") - but here we get blood-n-thunder action with such intensity that the pages literally smolder in your hands. 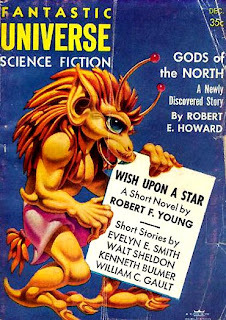 Doc Smith's stuff is close but not written as intelligently, and Robert Heinlein's "Universe" depicts a similarly mutinous crew on a generation ship. All good comparisons - but this pulp superhit is as engrossing, as it is unexpected and darkly intense. If you only read one story by Robert E. Howard (let's say you have an aversion to the ferocious blood-and-guts "death metal" fantasy, which is really what Conan is all about) - then read this one. It has more fantasy elements than most other stories and reads like a shockingly good (and tautly, vividly written) piece of Lovecraft or Clark Ashton Smith. Violence is still there, but more as a background color and atmosphere. The vision of an evil naked snow witch stalking the battlefields is going to stay with you for many years... truly the definition of "haunting". 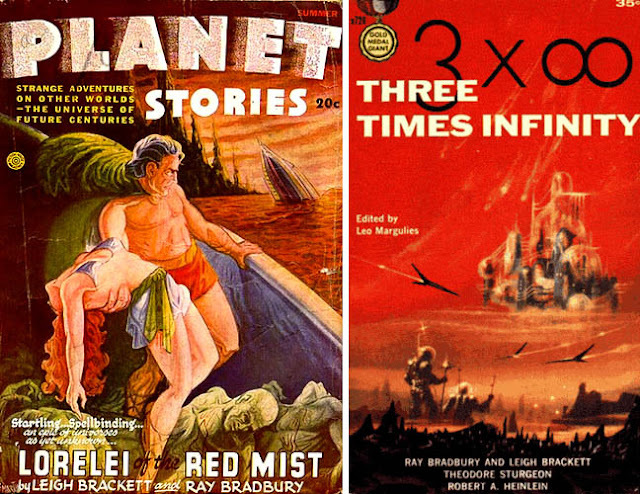 This story is part of the last Burroughs series: "Carson Napier on Venus". Reminded me of Alan Burt Akers "Scorpio" series, with the strange flying machines, fantasy-like aliens and clockwork primitive plot. Of course, Akers (pen name of Kenneth Bulmer) imitated Burroughs, but... Akers did it more engagingly, me thinks. Here, formulaic adventure is not as exotic and lush, as one might expect from Burroughs - however, it does contain one of the future staples of space opera: putting our heroes on display (hanging from a hook) in an alien museum, and their subsequent inevitable escape. "The Reformation of Joseph Reed"
One of the better examples of pulp fantasy humour, very light-hearted and oh-so-enjoyable tale about 1940s reporter and his sweetheart arriving at unusual marital agreement with help of two very charming miniature demons. These demons are rather like gremlins - but less mischievous and more cuddly, so they would rather fall into category of Borrowers, or some such (almost harmless) category. What's so enjoyable about this tale, is how typical and hilarious it is, a great romp (including usual cast of characters: an evil boss, mafiosi, smart blonde, etc) that would feel at home in "Unknown" pulp, or even if written by Henry Kuttner. So far the best Robert Moore Williams story I've read. 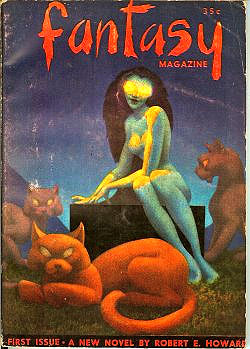 "The Beauty and the Beasties"
Another great find of pulp-styled humor. So far, one of the best stories about humans transformed into pet animals. Funny interaction between a dog, a cat and a mouse, who are actually people in desperate need to return to their proper selves. Worthy of being turned into a "Babe"-like movie, or a neat "Toy Story"-like animation. In the 1940s the radio, not movies was the focus of everyday entertainment, and a lot of pulp humour rotated around that - radio equipment and radio personalities became a subject of choice for many urban fantasy stories. This cute tale follows the journey of self-discovery and self-assertion of one very meek and shy man - with the help of an obnoxious radio set, which suddenly finds its voice... literally. The radio box speaks back, and not only its own mind, but the opinions of all popular radio hosts, amplified - in the meantime spoiling (or improving) our hero's miserable marriage. Cool story, smoothly told. Harrison Ford goes on a treasure hunt in the desert, saving a damsel in distress, captured by an evil archaeologist. There are fights in the crowded market, kidnappings, super-technology of the lost race, chases and double-crossings... enough plot and action to fill a movie script, complete with CG special effects in the end. Not bad for a totally forgotten pulp "lost world" fantasy. 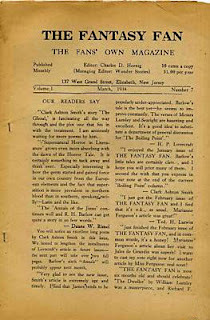 Also Read: Ultra-Rare Serials From "Fantasy Magazine"
Great list! 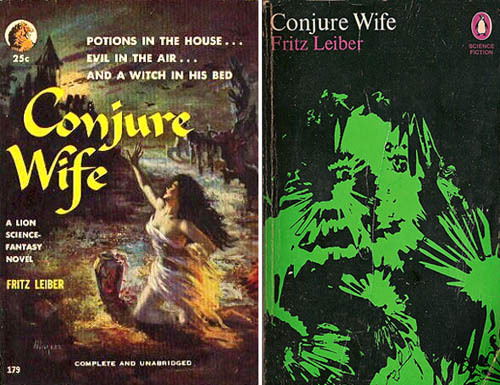 Only recently was I able to read "The Lake of The Gone Forever" when I pick up one of the Haffner collections. 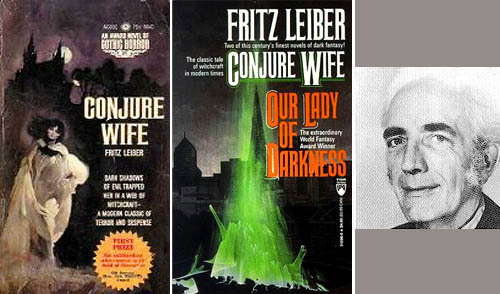 And kudos on choosing "Lorelei of the Red Mist". Was Vic Phillips' "Maiden Voyage" ever reprinted or will I need to track down a copy of Astounding? I found a copy of it from a used bookseller online. I'm going to pull the trigger on it. I'll let you know how I like it. That pulp has a really great cover! You're not kidding about making discoveries. I picked up a copy of Starling Stories from Jan 1948. It has Margaret St. Clair's "Aleph Sub One" (I liked it quite a bit) and it also has the "Blue Flamingo" by Hannes Bok, which I have yet to read. I also scored a Starling from 1946 with a Captain Future story that I've yet to read.